Portsmouth head coach Aaron Duncan observes his team in pregame warmups. The Portsmouth Trojans hit the road for the fourth straight week on Friday to take on the Gallia Academy Blue Devils. Both teams came in to the game 1-0 in the OVC and looking to establish some momentum heading in to conference play. Portsmouth took Gallia Academy down to the wire in a tight game throughout, but ultimately the Trojans fell short by a final score of 36-35. The loss was hard to swallow for the Trojans, as they attempted a two point conversion after a DJ Pearsall touchdown reception with 3:04 left to play made the score 36-35 in favor of the Blue Devils. Instead of kicking an extra point to tie the score at 36, Portsmouth and head coach Aaron Duncan went for the two point conversion. Trojans quarterback Isaac Kelly rolled out to his right, but his pass to Deante Parker fell short and the two point try was incomplete. Among the factors mentioned, Duncan also says he was concerned for his young kicker in the situation. In a game where both offenses stole the show, the Gallia Academy defense rose to the occasion when it mattered most to seal the win. Up to that point, there was plenty of scoring throughout. The Blue Devils struck first on the opening drive of the game when quarterback Justin McClelland broke free for a 25 yard rushing touchdown. Gallia Academy held a 6-0 lead early after failing on a two point conversion. Portsmouth fumbled inside the red zone on their first possession, but the Trojans were able to make a stand defensively and force the Blue Devils into a three and out to get the ball back in their hands. Kelly made the most of that as the offense marched right down the field. Kelly found Deante Parker on a screen pass, and Parker accelerated ahead for a 23 yard touchdown reception. The extra point gave Portsmouth a 7-6 lead with 8:18 remaining in the first quarter. The Portsmouth defense stood tall again on the next possession when Gabe Gambill forced a fumble on his tackle of McClelland in the backfield. The Trojans took advantage when Talyn Parker scored from five yards out. However, Portsmouth missed the extra point, and led 13-6 at that point. Gallia Academy made sure that was their only mistake of the game offensively, and the Blue Devils stepped up in the second quarter on a big run from Jacob Campbell who scored a 9 yard touchdown on fourth down. Gallia Academy went for two, and McClelland found Caleb Henry for two to give the Blue Devils a 14-13 lead with 7:39 remaining before halftime. The Blue Devils found the endzone once again before halftime with a big drive right before the break. Campbell caught a swing pass and got some excellent blocking down the right sideline on a big 3rd down and 9 play to score a 29 yard touchdown for Gallia Academy with just 47 seconds left in the first half. Campbell then ran for a two point conversion to give the Blue Devils a 22-13 cushion at the break. In the third quarter, both offenses exploded. Portsmouth got things going on their opening possession of the half when Kelly scored on a 6 yard touchdown scamper. Kelly then found Deante Parker for the two point conversion with 10:20 left to play in the third quarter. Gallia Academy, though, had the answer. The Blue Devils kept pounding with Campbell, and he delivered once more with a 43 yard touchdown run. A two point conversion helped Gallia pull ahead 30-21. Portsmouth was able to come back with a steady dose of Kelly, who this time ran for a 63 yard touchdown. Kelly faked a handoff to Talyn Parker in the backfield, then found a whole on the left side of the line and busted free for the long scoring run. Talyn Parker then pushed his way in for a two point conversion, and Portsmouth was once again within one, 30-29 with 8:42 left in the third quarter. While the Trojans had no issues scoring, neither did Gallia Academy for the majority of the second half. Campbell pushed his way in for his fourth touchdown of the day to put the Blue Devils up 36-29 with 4:41 remaining in the third. Looking to keep it at a two possession game, Gallia Academy went for two but were stopped short. Behind by just seven points, Portsmouth hit the field looking to score once more. However, a personal foul penalty proved to be costly and ultimately resulted in a Trojan punt. With the defensive stop, Gallia Academy was looking to close the game out. It looked as though the Blue Devils were going to do just that when they scored an 18 yard touchdown, but a block in the back negated the score. Still with a chance to close it out, McClelland and the Blue Devils tried to convert on a 3rd down with a pass to the endzone. The ball was deflected by Portsmouth’s Daniel Jordan, but bounced right in to the hands of Gallia Academy’s Garrett Burns. Fortunately for the Trojans, Burns was unable to complete the catch. The next play, Gallia Academy was unable to pick up the first down, and the Trojans had a renewed life. Right on cue, Portsmouth was able to score with 3:04 left to play when Kelly found fullback DJ Pearsall for a 24 yard touchdown pass. However, the try for two fell short and Portsmouth still trailed 36-35. Gallia Academy was able to milk the clock and grab their second conference win when Campbell picked up a huge first down on 3rd down and 6. Although the Trojans fell short, Kelly had another big game for Portsmouth. The quarterback for the Trojans finished with 266 total yards and four touchdowns. Portsmouth is also happy to have Talyn Parker back. Parker carried just four times in the season opener against Valley before leaving with an injury. In his first game back for the Trojans, he rushed for 103 yards on 20 carries and scored a touchdown. However, the defense will need to step up moving forward for Portsmouth. 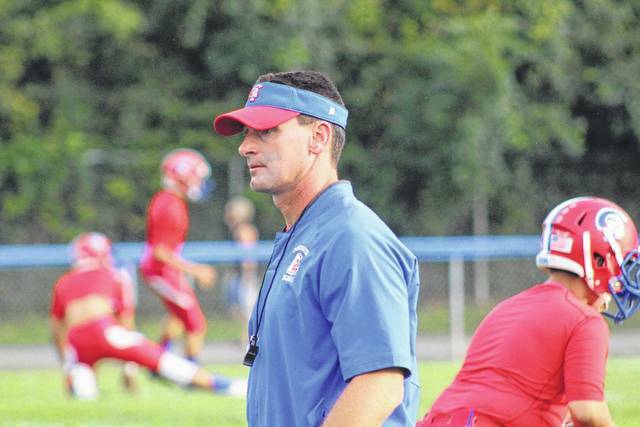 Duncan noticed his team had some issues on that side of the ball against Gallia Academy. Duncan’s group, who are now 2-3, will get a chance to work and improve on their techniques this coming week in practice before they host Coal Grove (4-1) on Friday night.